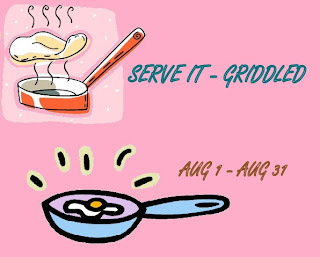 This month's theme for Serve It series is Serve It - Griddled. Every cuisine has its own specialty of dishes cooked in griddle or tava. It is believed that the first cooking vessel used by man was a flat top or a griddle. Although griddle cooking is primitive, it is something that is used for quick cooking. The griddle was the preferred method of making bread, before the invention if ovens. Yes, most countries have ancient types of breads that were made on the griddle like the English Crumpet, the Mexican tortilla, the Indian paratha or the French Crepes. Griddle breads can be made using a batter or a dough, that have either been proofed or used as such. And let us not forget eggs and omelettes that can be made on the griddle. So, why wait.. gird up the griddle, and start flipping..
1. 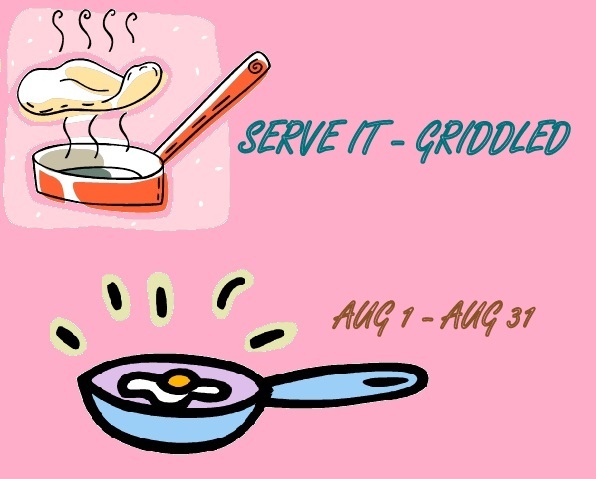 You may send in any entry that is made on a Pan, Tava or griddle. 2. Dosas, Rotis, Parathas, Pancakes, Crepes practically any dish made with a pan/griddle is allowed. But Curries, Noodles and Rice dishes are not allowed. Guess you got the idea. 3. Both Vegetarian and Non-vegetarian dishes are allowed, although no beef/pork/alcohol please. 4. Please link back to this announcement page and also to Denny's page here. 5. New entries are appreciated, however if you are sending archived entries, please re-post as latest (with a date in August 2012) and update with both the links to the announcement page and logo. 6. Usage of links and logo is mandatory. 7. Last date for submission of your entries is August 31, 2012. 8. To submit your entries, just link your entries using the linky tool below. 9. Non-bloggers also can send their entries with a picture to the below email-id. 10. If you have a problem in linking email us your problem to serveit[dot]series[at]gmail[dot]com. We will try to resolve it. Note: If the entries are inappropriate to the theme, we would have to remove the entries from the linky sans notification. If there are other issues like link or logo missing we would definitely notify through email. New to your space & thrilled with the recipe spread. Happy to follow you. Hi Krithi, have linked my Gobi Paratha recipe to your event. Hope u enjoy it. Please let me know if this is ok..So that I can re-enter my entry. hi krithi.. thanks for stopping by my space.. i have linked my entry..
Do leave your valuable comments here! I appreciate any critical comment which helps improve my posts, although inappropriate and rude comments will not be published. All Contents & Images in this website are copyright protected by © Krithi's Kitchen. Any unauthorized use is prohibited. All Images and content in this site are copyright protected by Krithi's Kitchen. Powered by Blogger.